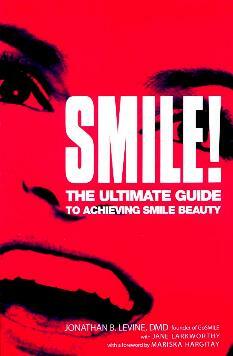 Author and dentist Jonathan B. Levine says, "My goal is to give people their most beautiful smiles possible." He and his wife Stacey co-founded GoSmile, a company that created the teeth whitening formula for his celebrity patients wanting to whiten their teeth safely and effectively. Dr. Levine says that "A strong smile has power. It increases the production of serotonin, which has been scientifically proved to elevate the mood of both the person giving the smile and the person receiving it." Now, not all of us have Hollywood smiles we can confidently flash, but in this book you'll learn all you need to know about caring for your teeth, repairing or replacing teeth, and in so doing, elevate your confidence and brighten your smile. Jonathan Levine discusses, among other topics, cavities and how to fill them, toothbrushes and toothpastes, oral hygiene, gums, and aesthetics which include porcelain veneers. Whiter teeth mean brighter smiles and if nothing else, the illusion of self-confidence. Not too white, of course. It's good to hear most over-the-counter teeth whitening applications appear to be okay to use (he does a comparision in the book). He also talks about what you should know about your dentitst (or potential dentist) and his manner is calming and encouraging. I can't stand it when people change their teeth so dramatically that their faces lose that reality aspect, and they attain a vacant look - the same for those who have too much plastic surgery - you want to stay as true to your own self as possible, always. Let's face it, not all of us can have a Christie Brinkley smile. At the end of the book there is a glossary and a resource guide where you can find dentistry information and the best dental schools in the country, and finally, an index. None of this comes cheap - be prepared. Personally, due to financial circumstances, I can see a marked deterioration of my teeth, even hairline cracks, and even a little chunk chipped off. I've always been too afraid (and too poor) to try teeth whitening. Thankfully, now I have a goal to strive for - something I now know the consequences of. Conclusion - No one with teeth should be without this wonderfully explanatory, informative, and very enlightening book on caring for and improving your teeth and oral hygiene.